In Asset Rotation, portfolio management pioneer Matthew P. Erickson demonstrates a time-tested approach to asset management that has worked throughout the history of capital markets, in good times and bad. Providing investors with strong participation in rising markets, but more importantly with a discipline to reduce participation in prolonged declines. Over time this revolutionary approach has yielded superior returns, with significantly reduced levels of risk; providing the engine for true, long-term sustainable growth. The investment world as we know it has changed, and the paradigm has shifted. What has worked in the past may no longer work in the future. No longer may bonds be regarded as a safe haven asset class, as for the first time in generations, investors in fixed income face losses as interest rates rise from historical all-time lows. For those adhering to a conventional Modern Portfolio Theory based investment approach to asset management, what was once regarded as safe and stable, may very well soon become our greatest impediment. Asset Rotation provides investors with a practical solution for today's real world problems. This tactical approach to asset management provides us with concrete proof that there is indeed a better way. We are standing on the precipice of an Investment Renaissance. What was previously impossible, is now possible. Find out how. Matthew Erickson gives investors a hands-on resource for how to navigate an increasingly difficult investment landscape, by providing them with keen insights into the most rapidly growing segment of the investment markets. MATTHEW P. ERICKSON is the CEO and Chief Investment Officer for Renaissance Capital Management, LLC, a boutique investment management firm located in Metropolitan Detroit, Michigan. Concurrently, Matt also serves as the CIO for Legacy Planning & Associates, Inc., an affiliated financial planning firm based out of Grand Rapids, MI. Among Matt’s primary functions is the day-to-day oversight and portfolio management of the firms’ proprietary investment portfolios. 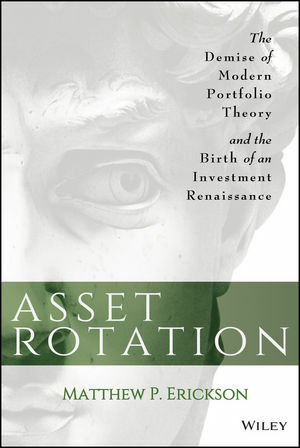 Each of the Renaissance Portfolios are managed in accordance to Matt’s proprietary systematic and tactical methods of asset management, blending together three stylistically different approaches to investment management, including tactical managed ETF portfolios, opportunistic individual stock portfolios, and traditional Modern Portfolio Theory based allocations with a “beta-rotation” overlay. By combining these three unique approaches into one overarching portfolio, investors are provided with a higher degree of diversification. Prior to starting his own asset management firm, Matt was a partner in a successful wealth management advisory practice at UBS Financial Services, overseeing more than $350 million in private client assets. Matt and his wife Jill currently reside in Canton, Michigan with their daughter Mackenzie and son Jacob.